Buy each little gold and silver correction next week! Load the boat. Open your pockets, put your money on the table, buy the mini-corrections, place some buy stops over the market in regular intervals and then pocket quickly next Friday or at the GUNNER24 Targets respectively. MOST LIKELY it’s going up for five more trading days altogether. Everything is pointing to that! A strong Friday in spite of the option expiration it was. In silver we make out a mere short squeeze. With Friday, the precious metals reached their 16th day of the upswing. Everything is pointing to an upswing for at least 21 days before the next important gold and silver top will be reached next Friday. The actual daily 8 Candle GUNNER24 Up hasn’t generated another buy signal "yet". That makes it easy for you. A daily close above the first double arc enables you and us a safe entry into another long position. 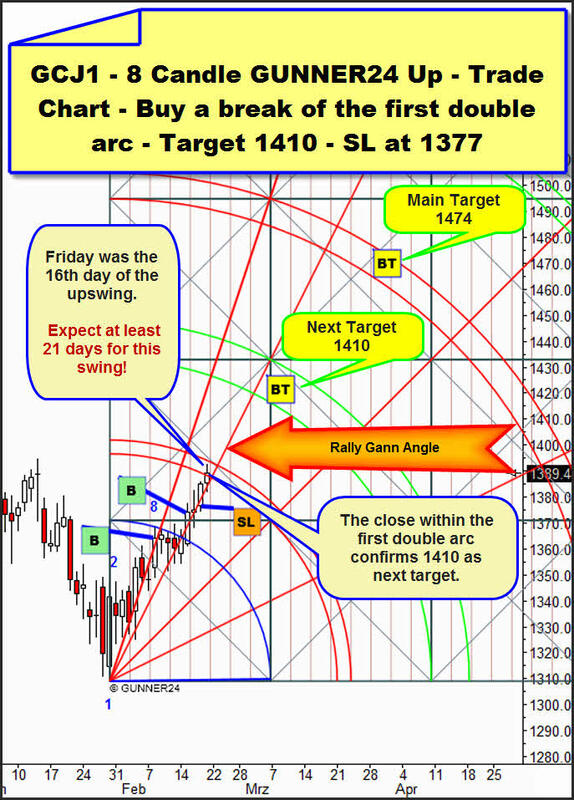 We see that the rally Gann Angle is submitting the targets in price and time. Friday closed very firmly and within the first double arc. That fact confirms the second double arc as to be the target. Friday was the 16th day of the upswing. That points to a 21 day rise. So we’ll have to await five more white candles with their respective higher highs. The trading tactics for next week might be as follows: On Monday there’ll be just electronic trading with poor volume because the Americans will celebrate their President’s Day. 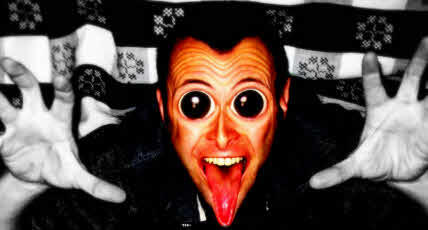 Experience shows that there won’t be any wild leaps. Being a Monday and besides a holiday and since Friday was strong the general mood remains positive. I.e. 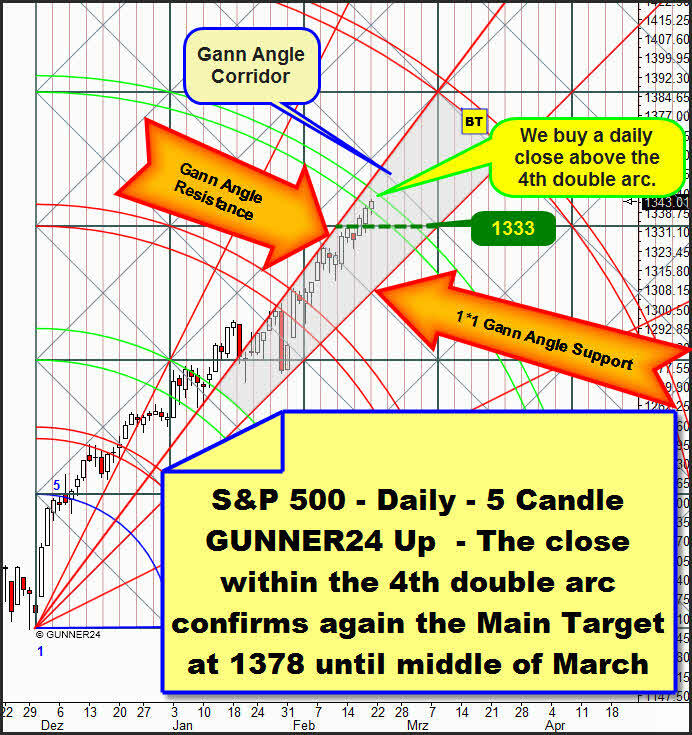 the rally Gann Angle shouldn’t break, but intraday it’s supposed to be fallen short of like the last seven days… It’s simply being tested again and again… During that test you may build up a first position at 1386-1387. In case of the break of the first double arc it will be a second position, and until the minimum target of 1410 you may have you stopped in with some further longs taking five Dollar steps. Don’t let yourself be got into a tizzy on Tuesday and Wednesday if the first double arc intraday is tested frequently, it should provide a good support at 1390-1394. When gold will have reached 1403 you will have to raise the SL from 1377 to those 1390-1394. 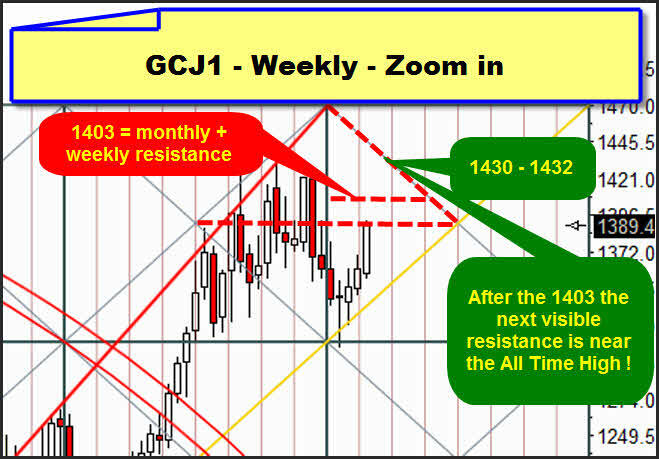 For in gold, the next important resistance after the break of the 1396 will be the 1403 in the monthly setup: http://www.gunner24.com/newsletter-archive/february-2011/06022011/. Intraday we’ll certainly have to reckon on a mini-correction there. A monthly target dominates, actually having always effects on the price. Even better would be you order our GUNNER24 Gold Trader at only 29.90 US$ a month. Thereby you’ll always be on the safe side concerning the current trades and the stop-loss adjustments. The GUNNER24 Gold Trader will provide you with the critical knowledge you need to forecast and analyse the precious metals with the GUNNER24 Forecasting Method. All the GUNNER24 Trading Signals you receive real-time are based on the acual Gold and Silver Future. The NEW GUNNER24 Gold Trader is a must for every actively working investor and trader who wants to trade successfully in everyday trading. The insights you receive from the head trader Eduard Altmann (and discoverer of the GUNNER24 Forecasting Method) are truly amazing sometimes. I promise! Click the button below and order the GUNNER24 Gold Trader - $29.90 US a month. For 101 members and up - $39.90 US a month. In the silver pit it’s like crazy! The physical demand is increasing, and that’s why silver rose unbraked last week again. There are hints that next week will continue like this…one of the best buying opportunities this year! Friday was extremely strong generating another daily buy signal. In one go as well the first double arc as the resistance Gann Angle were broken. As it were a "double buy candle". The trading tactics are generally the same as in gold. Try to build up some positions at 32.50-32.30 and then place your buy stops all over the market until the target area at 34.20-35.00 will be reached and then cover. Above, I emphasized the only important visible daily resistance. On Monday/Tuesday an intraday mini-correction might start there possibly leading back to the first double arc. A visible rebound from it should generate the energy for the 34-35. Do you still remember the weekly silver UGLY MONSTER of last week… If you don‘t – please read it up!! Everything is as it was predicted, isn’t it? 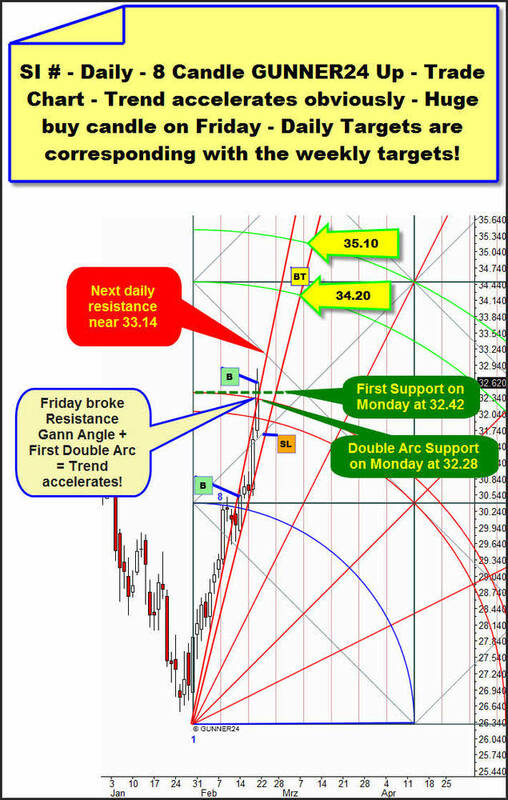 Apparently the resistance Gann Angle will have to be called at next week. Exactly at 34.68, above at red IV the resistance Gann Angle is lying. In case of such short squeezes exaggerations are possible because many market participants suffer, loose control, can either calculate or observe any more. That’s why now, one week before, I can’t foresee where the very last ones will press the panic sell button. But we’ll have to reckon on the possibility that here in the weekly setup the 4th double arc is being spiked as well in this panic move. It’s 35.00-35.50 or even 36.00. Another good advice on silver – don’t get greedy. Always think that the "big boys" rule the futures markets. In the entire Commodity Sector the large speculators (and also the small speculators at a certain range, because they seize the same position direction as the large ones) actually make too much money so the counterparts of the long positions being the commercials = big banks (as the executing instrument of the producers) are lying back by hundreds of billions of Dollars. Well, on Friday again margin hikes of almost as much as a 50 % were announced for next week. That will make things even more volatile in silver because the air is becoming thinner for the specs. Those ones actually have very high profits in their books, but they simply can’t wait out bigger intraday losses placidly but they will press the sell button more frequently to put into effect their profits. They won’t want to hold overnight so often any more but tend to even by closing. The commercials will undertake everything to keep silver down. There’ll be surprising, unending short attacks. That won’t start off after reaching the up targets. And: If silver reaches the 4th double arc that may be the top for weeks or even for months, respectively. 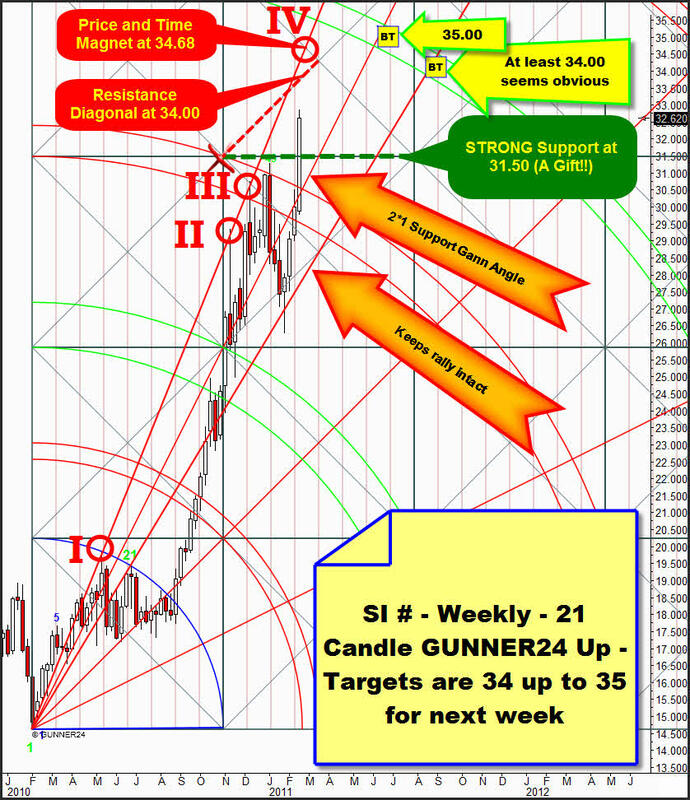 In the GUNNER24 Forecasting Method the commodities very frequently show the tendency to top at the 2nd and the 4th double arcs starting there a contrary GUNNER24 Setup. Everything is going well-ordered there. Target for this up-move are the 1378, and there’s nothing doubtful in this assessment. 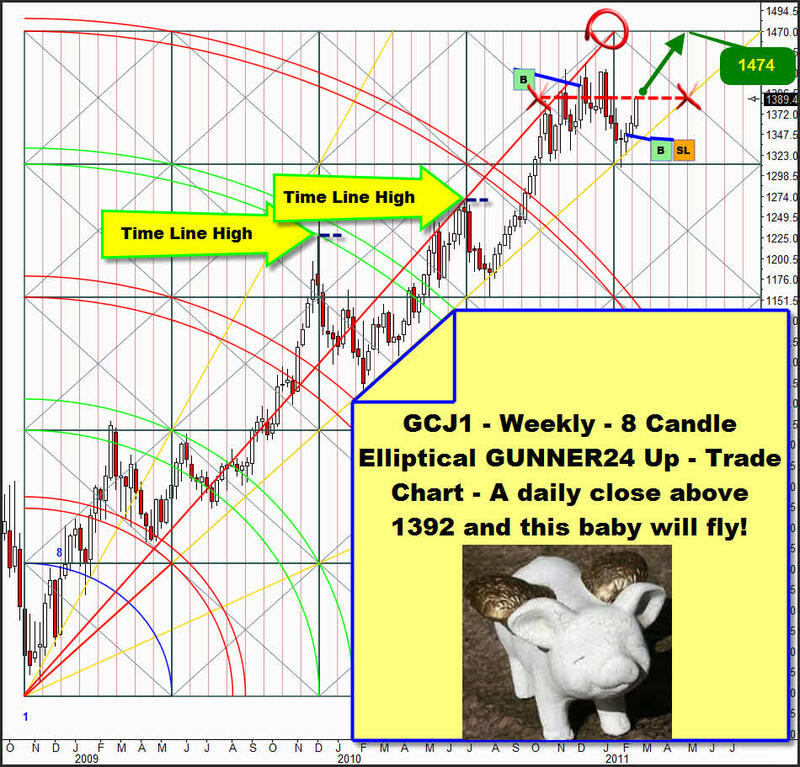 In the daily 5 Candle GUNNER24 Up we see that Friday closed within the 4th double arc. It’s another confirmation that the 5th double arc being the main target should be reached until the middle of March of 2011. We buy the break of the 4th double arc for the last upswing. Then the support Gann Angle will be the SL. Support for next week will be provided by the support horizontal that is residing at 1333. For our weekly long position (http://www.gunner24.com/newsletter-archive/february-2011/06022011/) we’ll adjust the SL to 1312 (MIT).